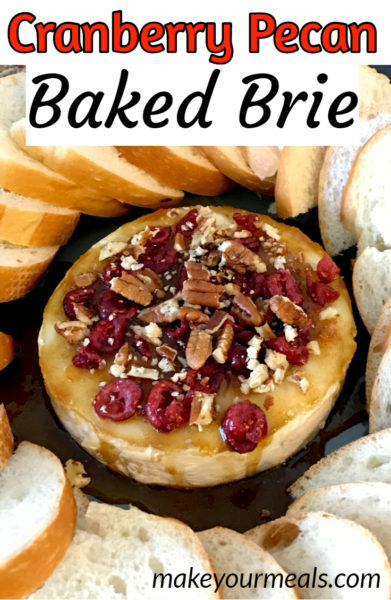 If you are looking for an easy to make appetizer to wow your guests, then Cranberry Pecan Baked Brie is just your answer! There is something elegant about an appetizer plate filled with hot and gooey baked brie. Surrounded by a wreath of crackers or baguette slices and you have a complete dish to start off the evening. Cranberry Pecan Baked Brie served with baguette slices. I first tasted brie when I was asked to help out at the cheese table at a work function. It was my job to make sure that the cheese plates remained stocked. So of course, when there was no actual work to be performed, I sampled the different cheese varieties. Lucky for me, each one was identified by a slate chalkboard stand. Otherwise, for the most part, I would have had no idea what I was eating. I could identify the basic cheese varieties on my own. White cheddar cheese has always been my favorite, so I could spot that one out quickly. 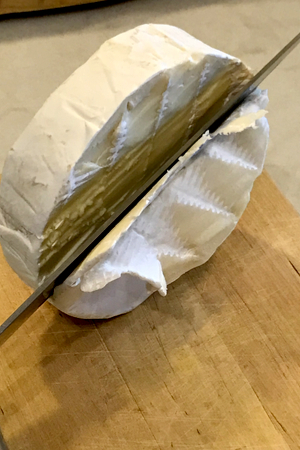 A wheel of brie unwrapped and ready for the rind to be trimmed. And it is very difficult to not know what Swiss cheese looks like. Of course, being a lover of hot cheese, I could definitely pick out the Pepper Jack chunks. I was even able to pick out a few smoked cheese based on the smell alone. However, there were quite of few of what I will call exotic cheeses on the platters as well. These were the varieties that I didn’t typically see stacked in the grocery store cooler aisles. This soft and creamy cheese was speckled with hints of blue throughout. When I took a bite I definitely could taste a buttery flavor and hints of salt. Not being a fan of blue cheese in general, I wasn’t impressed with the tangy flavor that the Blue Castello cheese left in my mouth. Taking the rind off the top of the brie will allow it to easily be scooped onto bread or crackers. I didn’t know it at the time, but Roncal cheese is made from sheep’s milk. It is a firmer cheese with tiny holes or pits throughout the cheese. The longer it ages, the more tangy that it becomes. I enjoyed tasting this cheese and will purchase it whenever I see it at a market. 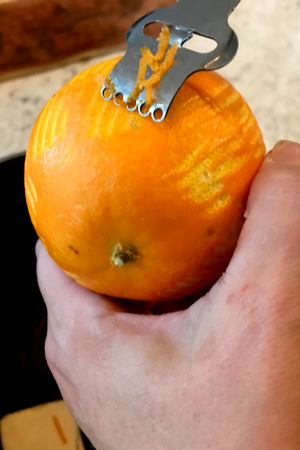 When zesting an orange be sure not to pull off any of the white pith. It will make the glaze have a bitter taste. As a young aged cheese Camembert is hard and crumbly with a milky sweet taste. However, the longer that it is aged a soft and smooth runny interior develops. The flavor is rich and buttery and the aged rind becomes edible. This is the cheese that I misidentified as brie. As soon as the glaze is boiling and becomes foamy, pour it over the baked brie. Similar to Camembert, brie is a cheese made from cow’s milk. The biggest difference is that brie has cream added to it which makes it even softer and creamier. There is even triple-cream brie! Brie has an edible rind that some people like and other’s don’t. This cheese can be eaten in both the solid cold state or baked. 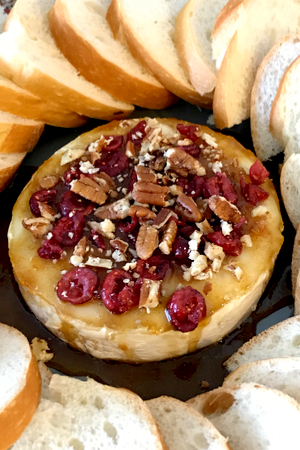 When making this cranberry pecan baked brie recipe, I prefer to take the top of the rind off so that the cheese can become hot and bubbly without the barrier of the rind. This makes it much easier to scoop the cheese onto crackers or baguette slices. The honey, maple syrup glaze poured over the baked brie. How To Make Cranberry Pecan Baked Brie…. This will be one of the easiest appetizers that you will ever make! 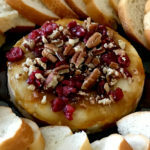 It requires only a few steps and in under 20 minutes you have an elegant cranberry pecan baked brie dish on the table. As stated earlier, I prefer to trim the top of the rind off. However, I leave the rest of the rind intact. It acts as a bowl that holds the melted brie from spreading across your entire plate. 10-15 minutes in the oven and it is ready! 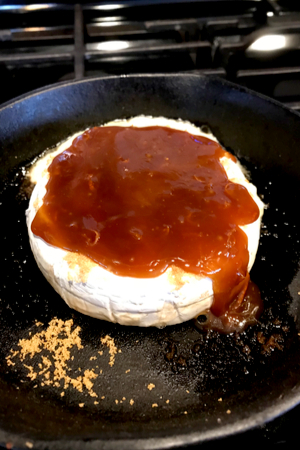 During the last few minutes, make the honey, maple syrup glaze and when you pull the brie out of the oven, pour it on top. Add a few dried cranberries and chopped pecans on top and you have a beautiful cranberry pecan baked brie ready to be served. And if you want to impress your guests even more, serve this with Smoked Salmon Phyllo Cups. A creamy and delicious appetizer that everyone loves and takes only minutes to prepare! Trim the rind off the top of the brie. *see note for the easiest way to trim the rind. 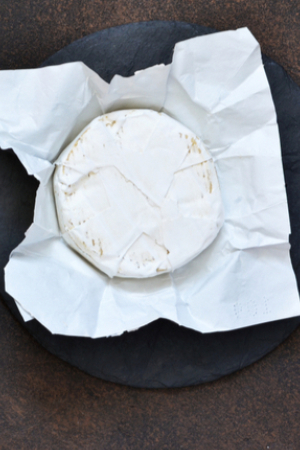 Place brie on a parchment paper lined, rimmed baking sheet, or directly in a small cast iron skillet. Sprinkle the top of the brie with 2 tablespoons brown sugar. Place into oven and bake until softened, about 10-15 minutes. Remove from oven and let cool for 5 minutes. 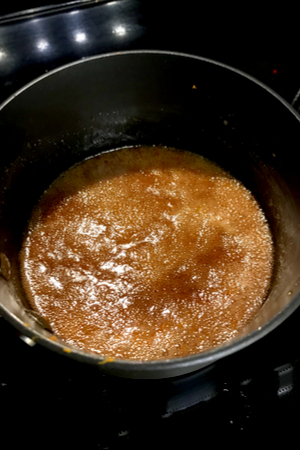 When the brie is resting, make the glaze: In a small saucepan over medium heat, combine brown sugar, honey, maple syrup, butter, cinnamon, and orange zest. Bring to a boil then reduce heat and simmer for 1-2 minutes until the mixture develops foam. Stir the cranberries and chopped pecans into the mixture. Top the brie with the glaze. Serve warm with crackers and/or baguette slices. At least an hour before serving, wrap the brie in plastic wrap and place in the freezer. Once it is firm, cut the top of the rind off.